Because of its importance, let's work together to create an awareness of how important the DD Form 214 is to our Veterans and their families and how important it is to be recorded at the Register of Deeds office. By recording your DD Form 214, the military service record is safeguarded, allowing Veterans an avenue to quickly obtain the document when needed. Recording the DD Form 214 is free. Once recorded, certified copies can be obtained by Veterans or their authorized representative(s). There is no charge for this service. Public access is restricted for a minimum of 80 years (Per NC G.S. 130A-93). To help make sure that your DD Form 214 (Certificate of Release or Discharge from Active Duty) has been recorded and protected, we are offering a few services to you. We have partnered with local businesses to offer discounts to those Veterans who present a Veterans “Thank You for Your Service” Photo ID to them. A list of participating businesses can be found above and is updated regularly. If you are interested in obtaining a Veterans “Thank You for Your Service” Photo ID, please bring your original DD Form 214 (or a certified copy) and a current driver’s license or other government-issued photo ID to our office between the hours of 8 a.m. and 4 p.m. Monday through Friday (excluding holidays). 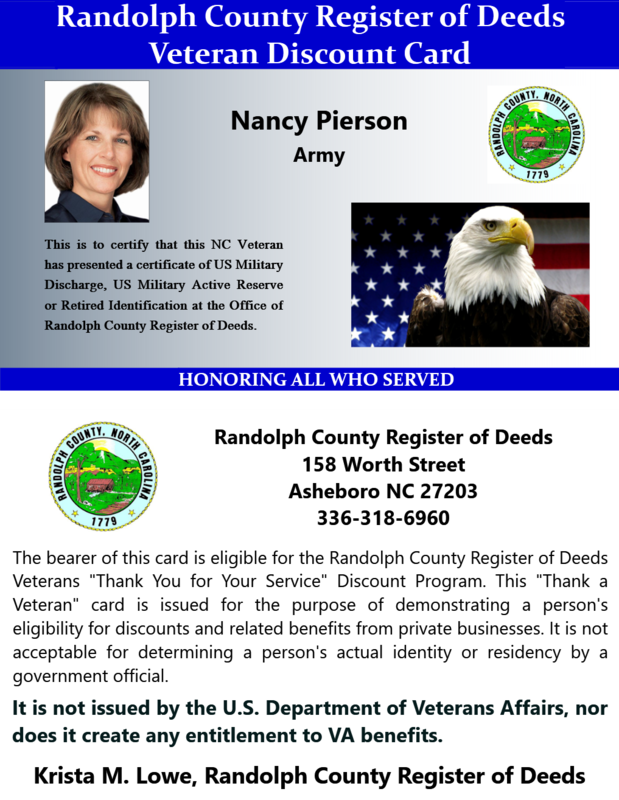 Veterans whose DD Form 214 has already been recorded in Randolph County will only need to bring their current driver’s license or other government-issued photo ID. The Register of Deeds office is located at 158 Worth Street in Asheboro, across from the historic courthouse. We would like to offer you the opportunity to honor and show your appreciation to our Veterans by participating in the program. In return, we will list your business, free of charge, on our website and will provide you with a sign that you can display at your business showing your support of our Veterans. Discounts may be a percentage of the sale, a specific dollar amount (both can be with restrictions) or you may wish to offer an incentive gift or gift card to the Veteran. It’s easy and it’s free to sign up. Along with the Merchant Application you can also find the updated list of participating merchants below. Thank you for helping us to honor our Veterans for their service to our Country!